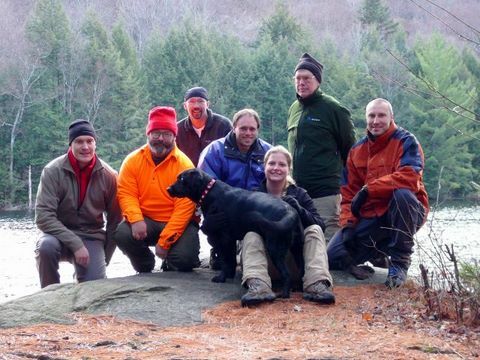 Seven members of WinterCampers.com did a pre-season overnight at the Murphy Lake leanto as a thru-hike; coming in from Pumpkin Hollow Road (3.8 miles), staying at Murphy Lake and hiking out (3.6 miles) to the Creek Road trail head on Sunday morning. We had nice weather with only a few snow flakes in the air. Trail conditions varied from muddy to wet to full running water. The most treacherous portions of the trail were the slime covered corduroy logs and wet bridge boards. Upon reaching the Murphy’s Lake we had to choose a side to traverse and we picked the wrong side of the lake. We had to bushwhack to skirt a large flooded bog that probably added 45 minutes to our hike. Upon reaching the leanto we donned warmer gear and had a rousing session of StopLight! At night we did a cook off between two cook groups with the steak, onions and peppers fajitas coming in 2nd to the multi-course meal of appetizers (10 year old sharp cheese, smoked salmon on crackers with mustard sauce), salad with sun dried tomatoes/feta cheese and choice of 2 dressings, creamy potato soup, chocolate pudding followed by some Merlot. Chris and Matt load up on fajitas while Mark stirs the soup. Although the temperatures dropped quickly Saturday afternoon the overnight temperatures remained in the mid-30s and Sunday morning was in the low 40s. Upon emerging at the trail head our return home was delayed by a dead battery in Sparky’s van. After 30 minutes of diagnostics Sparky and Chris lashed on sneakers and jogged back (via roads) to our vehicles at the Pumpkin Hollow trail head. Within an hour they returned from their 7 mile jog, we jumped Sparky’s van and were headed home. Having a couple of serious runners along was a real plus.